NEWINGTON - It looked like the Central CT Capitals AA (Newington) were going to pull out a win as the in the final minutes of the third period. That all changed in an instant. Despite a strong second-period surge, the Capitals were unable to hold off the Junior Thunderbirds (South Windsor) and Cody Soper. 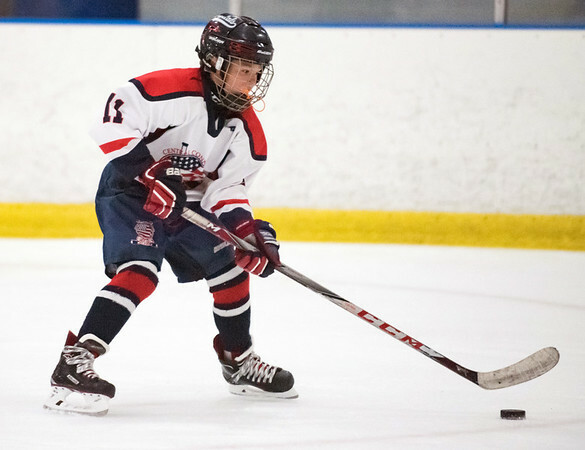 The forward scored the tying goal with 3:03 left and the game-winner with 1:10 remaining to hand Newington a 4-3 loss in the opening round of the Nutmeg Games 12U boys ice hockey tournament. All of Newington’s goals came in the second period. Jack Petronio scored the first goal for the Capitals just 21 seconds into the period. He sliced his way down the ice, wiggling in and out of opponents before finding the back of the net. Kayden Sharkevich also had a goal. Sharkevich used his speed to get up close and force the puck into the lower left corner of the goal. The final goal of the game for the Capitals, which put them ahead of the Thunderbirds, was scored by Jake Kulvinskas with 5:04 left in the period from the blue line marking the offensive zone. Newington had a chance to score in the third, but South Windsor goaltender Cody Shaw made a tremendous save. With two minutes left in the period, he was faced with a breakaway situation. His quick thinking allowed him to make the right move, blocking the incoming threat and preventing the Capitals from taking the lead. The Junior Thunderbird’s other two goals came from Logan Sherwood and Easton Gates. But Newington goalie Kyle Kunzelman was able to prevent South Windsor from gaining any real momentum through the first two periods before he was subbed for. Kunzelman acted as a defensive coordinator, vocally orchestrating his defense to get them in the correct position to block incoming attacks from the South Windsor team. “[I’m] talking to them a lot and really trying to keep the defense with me and in the right spot.” Kunzelman said. “Kyle did outstanding. Very consistent, pressure was on and he maintained his composure and played the way he always does,” Justin Kulvinskas said. Posted in New Britain Herald, Newington on Wednesday, 25 July 2018 21:05. Updated: Thursday, 26 July 2018 15:58.